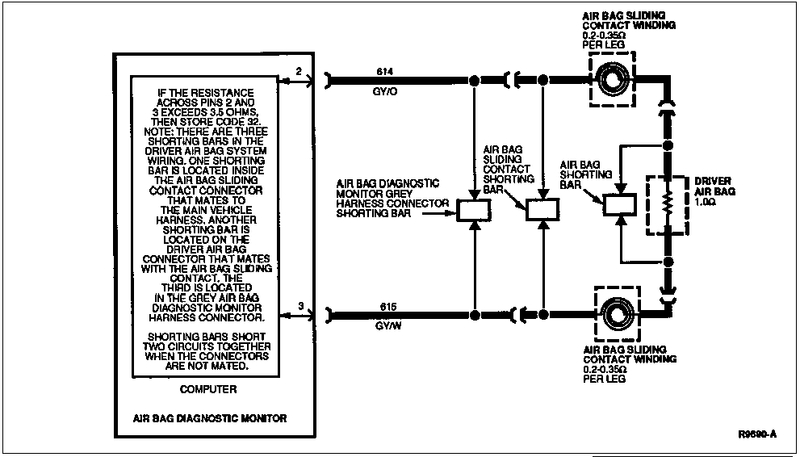 Mustang 1995 Air Bag Diagnostic Codes and Debug Information. Error code 32 is the most common air bag problem. Chances are Very Good that you have bad clock spring in the steering column. It is Very Easy to replace! Get a NEW one from Ford. They are not very expensive (between ?$45 to $90?). Do NOT waste your time or money getting a used one from the junk yard that may break soon. The clock spring connects the turning steering wheel to your stationary steering column. So, over time, they have a tendency to break. Here is a quick link to the Air Bag Error Codes. Continuous Air Bag Indicator - Diagnostic Trouble Code Timed Out, Diagnostic Monitor Disconnected or Inoperative, or No Ignition Voltage to Diagnostic Monitor. WARNING:	ALL COMPONENT REPLACEMENTS AND WIRING SERVICE MUST BE MADE WITH THE NEGATIVE BATTERY CABLE DISCONNECTED FOR A MINIMUM OF ONE MINUTE BEFORE SERVICE OR REPLACEMENT IS ATTEMPTED. If the air bag diagnostic monitor detects a fault in the air bag system, a Diagnostic Trouble Code (DTC) will be written to the air bag diagnostic monitor's Non-Volatile Random Access Memory (NVRAM). After servicing, the diagnostic trouble code may then be cleared from NVRAM. 2. WARNING:	THE BACK-UP POWER SUPPLY ENERGY MUST BE DEPLETED BEFORE ANY AIR BAG COMPONENT SERVICE IS PERFORMED. TO DEPLETE BACK-UP POWER SUPPLY ENERGY, DISCONNECT THE NEGATIVE BATTERY CABLE AND WAIT ONE MINUTE TO AVOID ACCIDENTAL DEPLOYMENT AND POSSIBLE PERSONAL INJURY. Wait one minute. This is the time required for back-up power supply in air bag diagnostic monitor to deplete its stored energy. 2. Wait one minute for back-up power supply in air bag diagnostic monitor to deplete stored energy. Air Bag Diagnostic "Trouble Code Clear" Connector -- Below glove compartment. WARNING: THE BACK-UP POWER SUPPLY ENERGY MUST BE DEPLETED BEFORE ANY AIR BAG COMPONENT SERVICE IS PERFORMED. TO DEPLETE BACK-UP POWER SUPPLY ENERGY, DISCONNECT THE NEGATIVE BATTERY CABLE AND WAIT ONE MINUTE TO AVOID ACCIDENTAL DEPLOYMENT AND POSSIBLE PERSONAL INJURY. Wait one minute. This is the time required for back-up power supply in air bag diagnostic monitor to deplete its stored energy. o A charging system concern has been identified by the diagnostic monitor and a DTC 12 indicated. DTC 12 will not be stored in the air bag diagnostic monitor's Non-Volatile Random Access Memory (NVRAM) under these circumstances. Correction of the charging system problem will eliminate the DTC. o An intermittent fault has occurred and the fault is no longer present. The diagnostic monitor may be programmed to flash "intermittent" DTCs 61-85 that are stored in NVRAM. Use the following procedure to access the stored DTC(s). 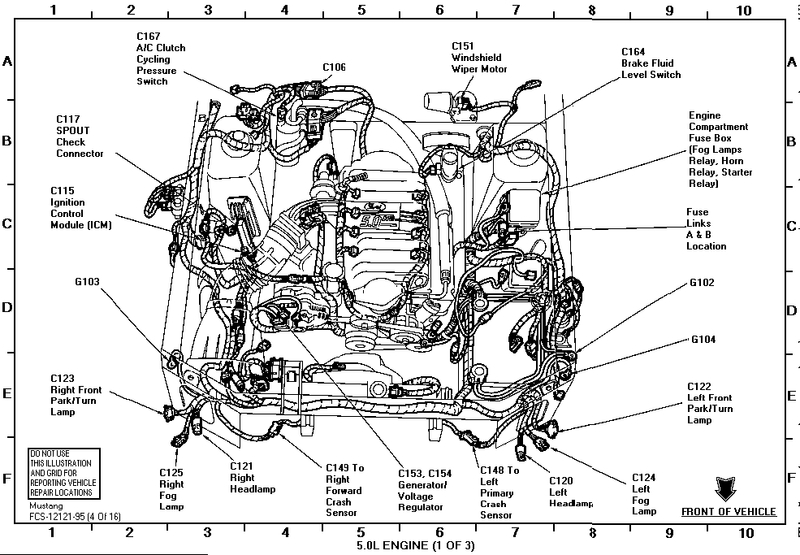 (1) Locate the air bag diagnostic service connector containing Circuit 631 (T/R). This is a grey connector under the glove compartment. (2) With the ignition key OFF, short Circuit 631 to the ground contained in the service connector or another good ground. (3) Turn the ignition key to RUN and observe the six second air bag indicator prove-out. (4) Within two seconds after indicator prove-out, remove the short on Circuit 631. (5) Stored DTCs will be displayed. After service, repeat steps 1-4 and clean the DTCs cleared using the �DTC Clearing Procedure� . Diagnostic trouble codes are prioritized numerically so that if two or more faults occur at the same time, the diagnostic trouble code with the highest priority will be displayed. After the DTC is displayed five times, the air bag indicator will illuminate continuously until the ignition switch is cycled. The air bag diagnostic monitor incorporates Non-Volatile Random Access Memory (NVRAM) to store diagnostic trouble codes and retain them indefinitely. The air bag diagnostic monitor will always flash the highest priority diagnostic trouble code stored in NVRAM. Diagnostic trouble codes may be cleared from the air bag diagnostic monitor after the fault conditions are serviced (see �Diagnostic Trouble Code Clearing� procedure for details). The air bag diagnostic monitor distinguishes between hard and intermittent (or repaired) fault conditions. Each diagnostic trouble code number 12 - 45 represents a hard fault (a fault that is still present). Hard diagnostic trouble codes are higher priority than intermittent diagnostic trouble codes, and may not be cleared from NVRAM. Each of these hard diagnostic trouble codes has an equivalent diagnostic trouble code which is the sum of the diagnostic trouble code number plus 40. This equivalent diagnostic trouble code will indicate that an intermittent condition exists, or that a hard condition has been repaired. Example: A Diagnostic Trouble Code 32 indicates that high resistance in the driver side air bag circuit has been, and still is, present. 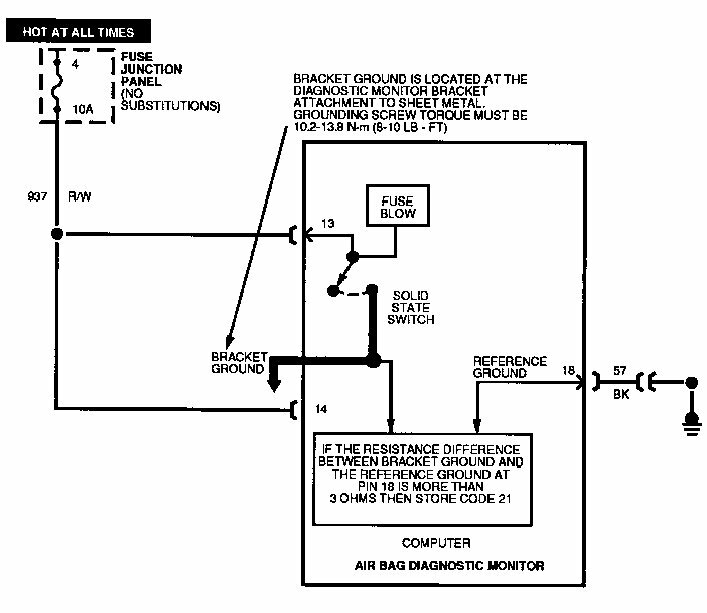 A DTC 72 (32 + 40) indicates that high resistance in the driver side air bag circuit existed at one time, but no longer exists due to an intermittent condition, or a repair made to the circuit. o	If a system fault exists and the Air Bag Warning Indicator is not functioning, an audible tone will be heard indicating a need for service. The tone is a series of five sets of five beeps. This DOES NOT indicate a diagnostic trouble code 55 or any other diagnostic trouble code. The Air Bag Warning Indicator must be serviced before diagnostic trouble codes can be determined. If a fault exists that makes unwanted air bag deployment possible, the air bag diagnostic monitor will attempt to remove deployment power by turning on a solid state switch to blow the 10A battery fuse. If the 10A battery fuse has successfully been blown by the air bag diagnostic monitor, the air bag diagnostic monitor will not attempt to blow it again until the proper fault has been serviced and cleared (see �Diagnostic Trouble Code Clearing� procedures for details). The air bag diagnostic monitor will store both the unwanted deployment diagnostic trouble code and the loss of deployment power diagnostic trouble code. The loss of deployment power diagnostic trouble code is the highest priority. WARNING:	THE BACK-UP POWER SUPPLY ENERGY MUST BE DEPLETED BEFORE ANY AIR BAG COMPONENT SERVICE IS PERFORMED. TO DEPLETE THE BACK-UP POWER SUPPLY ENERGY, DISCONNECT THE NEGATIVE BATTERY CABLE AND WAIT ONE MINUTE TO AVOID ACCIDENTAL DEPLOYMENT AND POSSIBLE PERSONAL INJURY. The air bag diagnostic monitor includes an internal back-up power supply. This feature provides sufficient back-up power to deploy the air bags in the event that the battery (10653) or battery cables are damaged in a collision before the crash sensors are activated. The back-up power supply will deplete its stored energy approximately one minute after the negative battery cable is disconnected. o	Electronic air bag diagnostic monitor (14B056) with integrated back-up power supply and safing sensor. Wait one minute for back-up power supply in air bag diagnostic monitor to deplete stored energy. 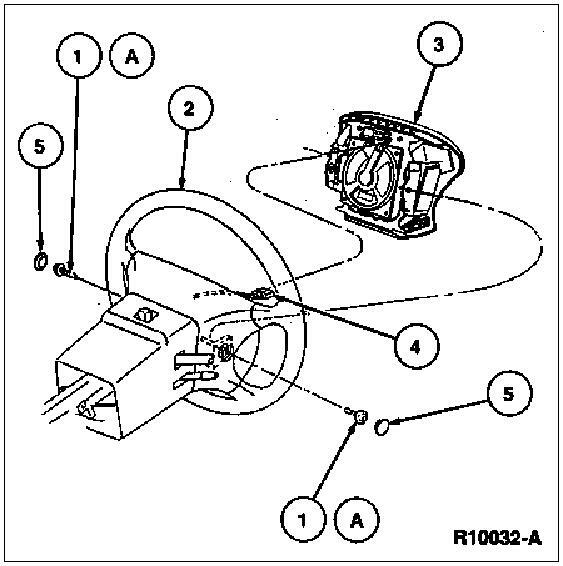 Remove Rotunda Air Bag Simulator 105-00010 or equivalent from vehicle harness connector at top of steering column. Reconnect driver side air bag module. Position driver side air bag module on steering wheel and secure with two screw and washer assemblies (8 mm). Tighten screw and washer assemblies to 10.2-13.8 N-m (8-10 lb-ft). Install two back cover plugs. Remove air bag simulator from vehicle harness connector on passenger side. Reconnect and install passenger side air bag module as outlined. SYSTEM CONNECTED AND ENGINE RUNNING "CHARGING SYSTEM VOLTAGE"
A charging system concern has been identified by the diagnostic monitor and a DTC 12 indicated. DTC 12 will not be stored in the air bag diagnostic monitor's Non-Volatile Random Access Memory (NVRAM) under these circumstances. Correction of the charging system problem will eliminate the DTC. An intermittent fault has occurred and the fault is no longer present. The diagnostic monitor may be programmed to flash "intermittent" DTCs 61-85 that are stored in NVRAM. Use the following procedure to access the stored DTC(s). 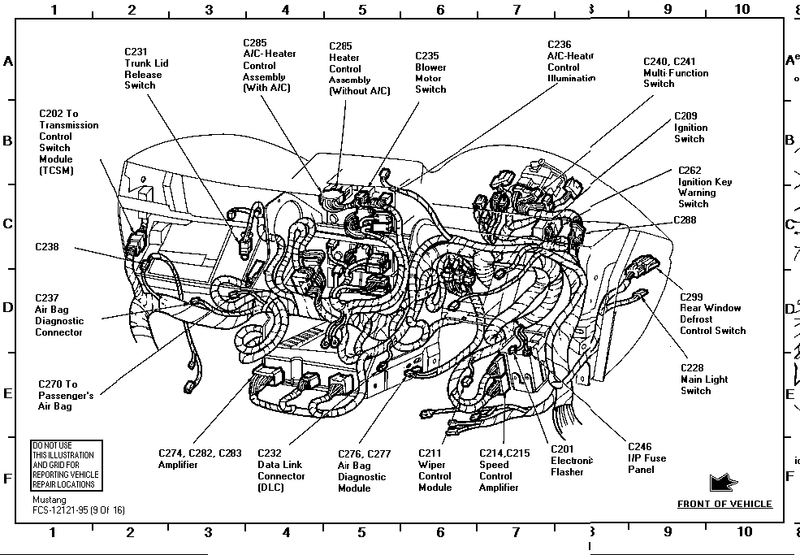 (1)	Locate the air bag diagnostic service connector containing Circuit 631 (T/R). This is a grey connector under the glove compartment. (2)	With the ignition key OFF, short Circuit 631 to the ground contained in the service connector or another good ground. (3)	Turn the ignition key to RUN and observe the six second air bag indicator prove-out. (4)	Within two seconds after indicator prove-out, remove the short on Circuit 631. (5)	Stored DTCs will be displayed. After service, repeat steps 1-4 and clean the DTCs cleared using the �DTC Clearing Procedure� . Prolog: If you get one of these stupid Code52's "most of the time" this happens when the battery is disconnected. Only mid-90's stangs throw codes when that is done. If you got the code after you disconnected the battery, then just go straight to the Diagnostic Code Clearing Section. Refer to Diagnostic Trouble Code �12� . Return to DTC 52 for Pinpoint Tests. The air bag diagnostic monitor measures the voltage at Pin 14 of the air bag diagnostic monitor connector. Voltage at Pin 14 should be equal to battery voltage. If the voltage at Pin 14 drops to less than 8 volts, the air bag diagnostic monitor will flash out on the air bag indicator a DTC 12. If the voltage at Pin 14 drops to less than 5 volts, the DTC 12 will also be stored in memory. Should the loss of battery voltage at Pin 14 be intermittent or repaired, the air bag diagnostic monitor will flash out a DTC 52 (or higher priority code if one exists) on the next ignition switch cycle. WARNING: UNDER NO CIRCUMSTANCES SUBSTITUTE ANOTHER FUSE VALUE. ANY FUSE OTHER THAN 10A MAY CAUSE DISARMING FAILURE AND MAY RESULT IN DANGER TO THE OCCUPANTS OF THE VEHICLE. DO NOT ATTEMPT TO REPLACE THE 10A FUSE UNLESS THE AIR BAG SYSTEM FIRST HAS BEEN DEACTIVATED (SEE �DEACTIVATION� PROCEDURE FOR DETAILS). NOTE: If a short to ground exists on any of the Circuits 607 (LB/O), 614 (GY/O), 615 (GY/W), or 616 (PK/BK) leading to a DTC 13 or 53, or similarly a short to ground exists on any of Circuits 617 (PK/O), 619 (PK/W), 624 (Y/W), 625 (Y/LG) leading to a DTC 14 or 54, the air bag diagnostic monitor will activate a solid state switch at Pin 13 of the air bag diagnostic monitor. This causes the 10 amp battery fuse to blow, thus disarming the air bag system and preventing inadvertent air bag deployment. If the 10 amp fuse junction panel (or power distribution in some vehicles) battery fuse has blown, it must be replaced by a 10A fuse. An open in the battery circuit that would prevent battery voltage from reaching air bag diagnostic monitor Pin 14. A short to ground on the battery feed circuit between the fuse and Pin 13 or Pin 14 of the air bag diagnostic monitor. A concern in the charging system causing battery voltage to drop below 8 volts. After the air bag diagnostic monitor has disarmed the air bag system, it will not be enabled to disarm again until the appropriate condition (DTC 13, 14, 53, or 54) has been serviced and cleared (refer to �DTC 13� , �14� , �53� , and �54� and �Diagnostic Trouble Code Clearing� descriptions for further details). o	Cycle the ignition switch to OFF and then to RUN and confirm that DTC 52 is flashing on the air bag indicator. o	Read the normal operation description for DTC 12. Read the pinpoint test for DTC 12 as a reference. o	Examine the diagnostic trouble code schematic. Look for areas where intermittent faults may occur. o	Is the diagnostic trouble code operation well understood? NOTE: This is an intermittent or repaired fault. The fault condition is no longer present. No RE-EXAMINE appropriate descriptions and schematics. Failure to understand air bag system functions will result in needless replacement of system components and repeat service. o	Has a DTC 12 just been serviced and repaired? o	Check battery fuse feeding air bag diagnostic monitor Pins 13 and 14. Fuse should be 10A, NO SUBSTITUTIONS. o	Clear DTC 52 (refer to �Diagnostic Trouble Code Clearing� procedure). o	Does another diagnostic trouble code start flashing? PROCEED to the description, schematic and pinpoint tests of the DTC that is flashing. NOTE: An intermittent charging system or battery concern could lead to a DTC 52.
o	Has a charging system concern been reported or noticed on the vehicle? SERVICE charging system concern. GO to �52-3�. Visually inspect all crimps, terminals, fuses, wires, etc. in the battery circuit feeding Pins 13 and 14 of the air bag diagnostic monitor. Look for poor connections, pinched wires, etc. An intermittent open in the battery circuit could lead to a DTC 52.
o	Are any concerns noticed? Yes SERVICE concerns in battery feed. GO to �52-3�. No RE-EXAMINE diagnostic trouble code description and schematic. LOOK for causes of intermittent low battery voltage at Pin 13. ATTEMPT to recreate hard faults by driving vehicle, flexing wire harnesses, etc., cyclingignition switch frequently. SERVICE any intermittent concerns if found. GO to �52-3�. 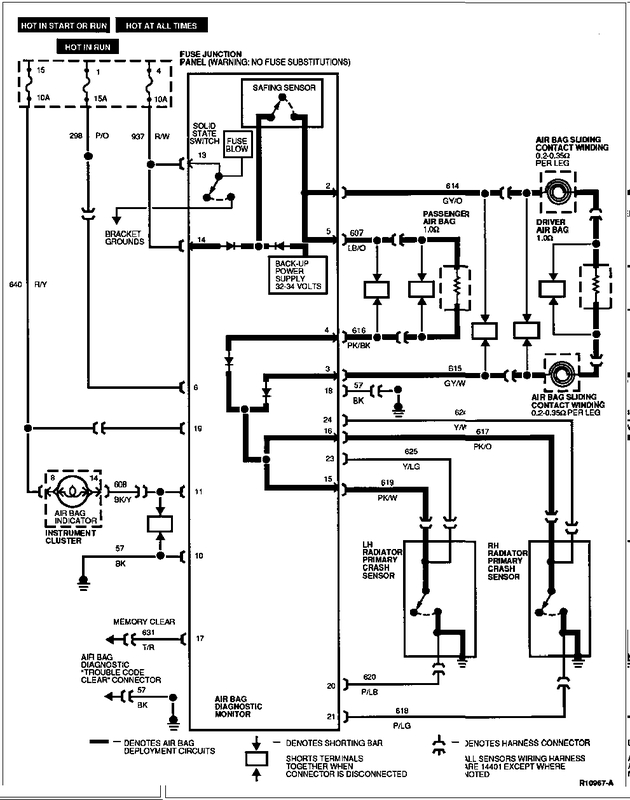 o	Cycle the ignition switch to OFF and then to RUN and confirm that DTC 53 is flashing on the air bag indicator. o	Read the normal operation description for DTC 13. Read the pinpoint tests for DTC 13 as a reference. o	Has a DTC 13 just been serviced and repaired? o	Check battery fuse feeding diagnostic monitor Pins 13 and 14. Fuse should be 10A, NO SUBSTITUTIONS. o	Clear DTC 53 (refer to �Diagnostic Trouble Code Clearing� procedure). Yes PROCEED to the description, schematic, and pinpoint tests of the diagnostic trouble code that is flashing. o	Look for pinched or chafed wires. NOTE: An intermittent short to ground on the above wires could lead to a DTC 53. Yes SERVICE wiring concern. GO to �53-3�. o	Visually inspect air bag sliding contact wiring at harness connector. o	Visually inspect wiring in steering wheel hub where air bag sliding contact mates to driver air bag connector. o	Visually inspect wiring where passenger air bag mates to harness connector. Look for signs of corrosion of resistance to ground. NOTE: Intermittent resistance to ground in the above wires or corrosion in a primary sensor could lead to a DTC 53. Yes REPLACE respective radiator primary crash sensor if significant corrosion is found. SERVICE wiring concerns. GO to �53-3�. No RE-EXAMINE diagnostic trouble code description and schematic. LOOK for causes of intermittent shorts or resistance to ground on the appropriate circuits. ATTEMPT to recreate hard faults by driving vehicle, flexing wire harnesses, etc., cycling ignition switch frequently. SERVICE any intermittent concerns, if found. GO to �53-3�. Normal Operation The air bag diagnostic monitor measures the voltage at Pins 2, 3, 4, and 5 of the air bag diagnostic monitor connector. The voltage at these pins is set by the air bag diagnostic monitor and varies with charging system voltage (the expected voltages are shown in the following table). If the air bag diagnostic monitor detects low voltage on any of these pins, the air bag diagnostic monitor will store in memory and flash out on the air bag indicator a DTC 13 to indicate a possible short to ground on these circuits. At the same time the air bag diagnostic monitor begins flashing out DTC 13, it attempts to disarm the air bag system to prevent inadvertent deployment of the air bag(s) by blowing the 10A battery fuse feeding air bag diagnostic monitor Pins 13 and 14. It attempts to blow the fuse by activating a solid state switch which shorts the battery feed at Pin 13 to sheet metal ground at the air bag diagnostic monitor's bracket. The air bag diagnostic monitor will make up to three attempts to blow this fuse, spaced one minute apart. o	If the air bag diagnostic monitor has blown the fuse and thus removed battery voltage at Pin 14, a DTC 12 will be stored (refer to DTC �12� and �52� for further details). o	If the air bag diagnostic monitor attempts to blow the 10A battery fuse three times and fails each time, a DTC 24 will be stored (refer to DTC �24� and �64� for further details). o	After the 10A fuse is blown or three attempts to blow it fail, the air bag diagnostic monitor will not attempt to disarm again until the DTC 13 condition has been serviced and cleared (refer to �Diagnostic Trouble Code Clearing� for further details). o	Should the short on Pins 2, 3, 4 or 5 be intermittent or repaired, the air bag diagnostic monitor will flash out a DTC 53 (or a higher priority DTC such as DTC 12 if one exists) on the next ignition switch cycle. o	A short to ground on Circuits 607 (LB/O), 614 (GY/O), 615 (GY/W), or 616 (PK/BK) causing the diagnostic voltage to drop. o	Resistance to ground on Circuits 617 (PK/O), 619 (PK/W), 624 (Y/W), 625 (Y/LG) or internal resistance to ground in either of the radiator primary crash sensors may activate an air bag diagnostic monitor circuit which may cause the voltage to drop. o	An internal short to ground within the air bag sliding contact (14A664) causing the driver side air bag circuit(s) to be shorted to ground. o	An internal short to ground within the driver side air bag module (043B13) or passenger side air bag module (044A74). Cycle the ignition switch to OFF and then to RUN and confirm that DTC 13 is flashing on the air bag indicator. Read the normal operation description for DTC 13. 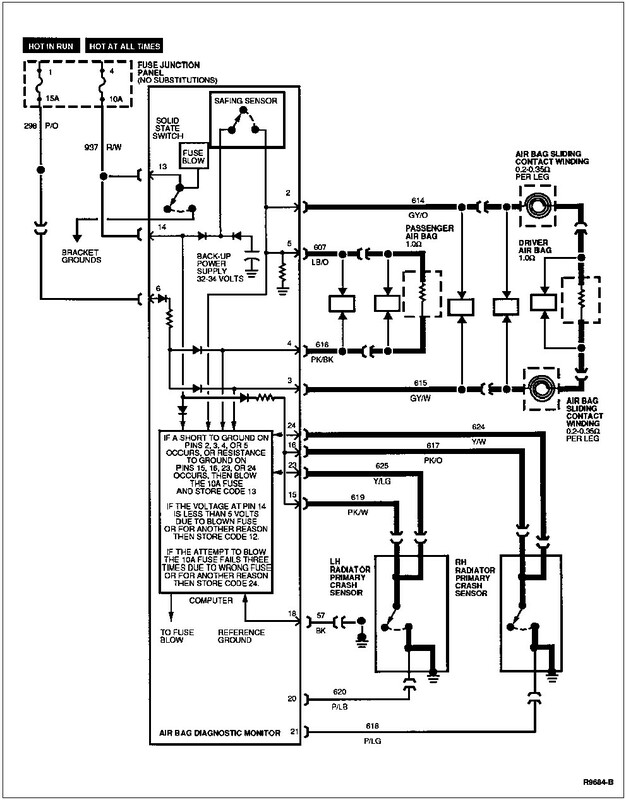 Examine the diagnostic trouble code schematic. Is the diagnostic trouble code operation well understood? NOTE: This is a hard fault. The fault condition may not be cleared until it is serviced and flashes out as a DTC 53. Under normal circumstances a DTC 12 will have just been serviced. o	Deactivate system. Carefully disconnect air bags during deactivation. o	Turn ignition switch from OFF to RUN. o	Is DTC 13 still flashing? o	Disconnect air bag diagnostic monitor. o	Examine wiring and connector where air bag sliding contact mates to main vehicle harness underneath steering column. o	Check for pinched and/or chafed wires. o	Measure resistance between air bag diagnostic monitor harness connector Pin 2 (Circuit 614, GY/O) and Pin 18 (Circuit 57, BK). o	Is Pin 2 shorted to ground? Yes LOCATE and SERVICE short to ground in Circuit 614 (GY/O), Circuit 615 (GY/W), or air bag sliding contact wiring. RECONNECT system. CYCLE ignition switch. PROCEED to the description, schematic, and pinpoint tests of the diagnostic trouble code that is flashing. o	Measure resistance between air bag diagnostic monitor harness connector Pin 5 (Circuit 607, LB/O) and Pin 18 (Circuit 57, BK). o	Is Pin 5 shorted to ground? Yes LOCATE and SERVICE short to ground in Circuit 607 (LB/O) or Circuit 616 (PK/BK). RECONNECT system. CYCLE ignition switch. PROCEED to the description, schematic, and pinpoint tests of the diagnostic trouble code that is flashing. o	Measure resistance between air bag diagnostic monitor harness connector Pin 15 (Circuit 619, PK/W) and Pin 18 (Circuit 57, BK). o	Measure resistance between air bag diagnostic monitor harness connector Pin 16 (Circuit 617, PK/O) and Pin 18 (Circuit 57, BK). o	Are resistance readings infinite (open)? Yes REPLACE air bag diagnostic monitor and bracket. RECONNECT system. VERIFY system. REACTIVATE system. o	Disconnect radiator primary crash sensor corresponding to the circuit with resistance to ground found in Step 13-5.
o	Measure resistance across normally open contacts of radiator primary crash sensor at the sensor connector. o	Is resistance reading infinite (open)? Yes LOCATE and SERVICE resistance to ground in wiring harness on affected circuits. RECONNECT system. CYCLE ignition switch. PROCEED to the description, schematic, and pinpoint tests of the diagnostic trouble code that is flashing. No REPLACE respective radiator primary crash sensor. RECONNECT system. CYCLE ignition switch. PROCEED to the description, schematic, and pinpoint tests of the diagnostic trouble code that is flashing. DO NOT ATTEMPT THE FOLLOWING UNLESS YOU KNOW EXACTLY WHAT YOU ARE DOING AND EXACTLY WHAT TYPE OF DVM YOU HAVE. o	Make sure that shorting bar is properly installed in passenger side air bag connector. WARNING: USE A HAND-HELD DIGITAL OHMMETER WITH LESS THAN 10MA SHORT-CIRCUIT CURRENT ON THE LOWEST RESISTANCE SCALE POSSIBLE (TYPICALLY 200 OHMS SETTING). FAILURE TO USE A METER OF THIS TYPE MAY CAUSE PERSONAL INJURY DUE TO AIR BAG DEPLOYMENT. o	Measure resistance between either of the terminals in the passenger side air bag connector and the metal case of the passenger side air bag module. Yes REPLACE driver side air bag module. RECONNECT system. CYCLE ignition switch. PROCEED to the description, schematic, and pinpoint tests of the diagnostic trouble code that is flashing. No REPLACE passenger side air bag module. RECONNECT system. CYCLE ignition switch. PROCEED to the description, schematic, and pinpoint tests of the diagnostic trouble code that is flashing. Refer to Diagnostic Trouble Code �21� . Return to DTC 61 for Pinpoint Tests. The air bag diagnostic monitor measures the resistance between the ground connection at its bracket and the reference ground at Pin 18. If the air bag diagnostic monitor measures a difference of more than 3.0 ohms between the ground at Pin 18 and the ground at its bracket, the air bag diagnostic monitor will store in memory and flash out a DTC 21 on the air bag indicator. Should the difference in resistance between Pins 18 and air bag diagnostic monitor bracket ground be serviced or otherwise reduced to less than 3.0 ohms, the air bag diagnostic monitor will flash out a DTC 61 (or a higher priority DTC if one exists) on the next ignition switch cycle. A poor attachment of the air bag diagnostic monitor due to loose mounting, dirt, or corrosion at the air bag diagnostic monitor bracket mounting surface(s). A poor reference ground at Pins 10 and 18 of the air bag diagnostic monitor Circuit 57 (BK). The 1994 stang is the same as the 1995 stang. It is right under the glove box. You don't have to remove the glovebox, it can be seen right under the glovebox. It's a small grey connector, but with two pins inside. Upon each cycle of the ignition switch (11572), the air bag diagnostic monitor checks for diagnostic trouble codes written in NVRAM. If any diagnostic trouble codes exist in NVRAM, the air bag diagnostic monitor will then check to see if these fault conditions are still present. l	If the conditions of the diagnostic trouble code in NVRAM are still present, then the air bag diagnostic monitor will use the air bag indicator to flash out the diagnostic trouble code number that was written in memory. l	If the conditions of the diagnostic trouble code are not still present (indicating an intermittent or serviced fault), the air bag diagnostic monitor will use the air bag indicator to flash out a DTC which is the sum of the diagnostic trouble code in NVRAM plus 40.
l	If the resistance is still high, the air bag diagnostic monitor causes the air bag indicator to flash out a DTC 32.
l	If the resistance falls within the normal range due to service or an intermittent condition, the air bag diagnostic monitor causes DTC 72 to be flashed on the air bag indicator. 1. Follow the diagnostic procedures as outlined to service the fault condition flashing on the air bag indicator. 2. Cycle the ignition switch to OFF and then to RUN. 3. Observe air bag indicator prove-out (six � two seconds) followed by diagnostic trouble code (52-85) flashing completely one time. 4. 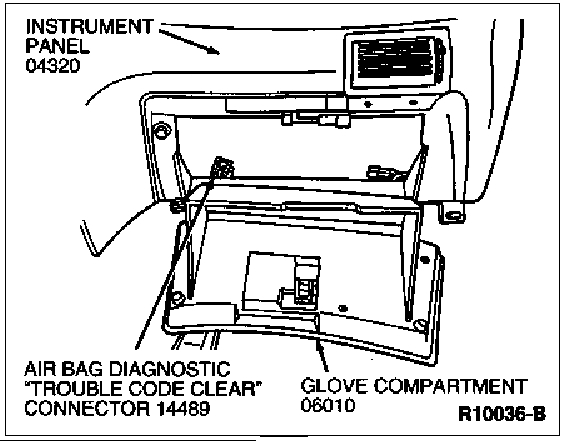 Locate the Diagnostic "Trouble Code Clear" Connector located underneath the glove compartment (06010) containing Circuits 631 (T/R) and 57 (BK). 5. Use a jumper wire to short Circuit 631 (T/R) to Circuit 57 (BK) or to another good ground. This short must be made after the diagnostic trouble code flashes completely one time, but before the warning light stays on continuously. 6. Hold short until air bag diagnostic monitor tone sounds (approximately five seconds). 7. 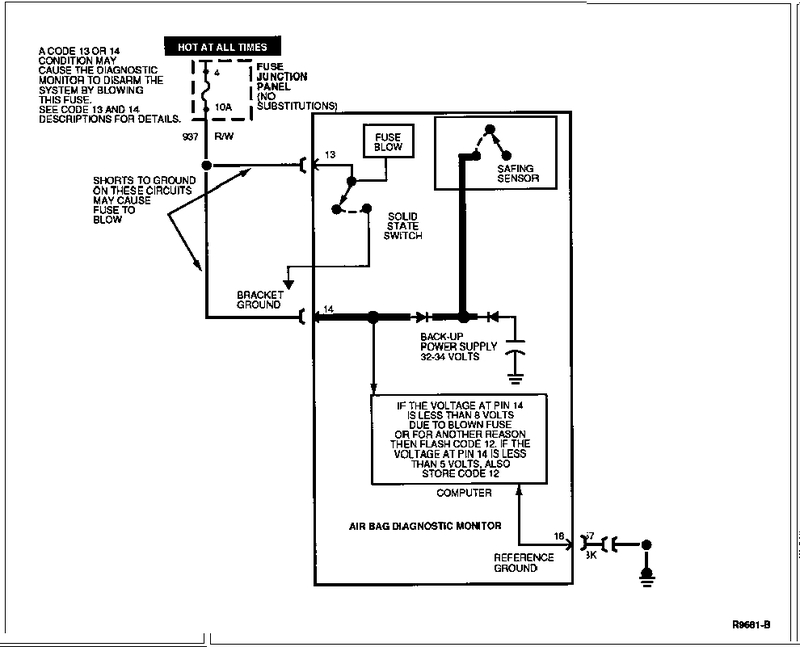 Release short on Circuit 631 (T/R) to Circuit 57 (BK). This short must be released within 25 seconds after the diagnostic monitor tone sounds. l	A charging system concern has been identified by the diagnostic monitor and a DTC 12 indicated. DTC 12 will not be stored in the air bag diagnostic monitor's Non-Volatile Random Access Memory (NVRAM) under these circumstances. Correction of the charging system problem will eliminate the DTC. l	An intermittent fault has occurred and the fault is no longer present. The diagnostic monitor may be programmed to flash "intermittent" DTCs 61-85 that are stored in NVRAM. Use the following procedure to access the stored DTC(s). While the ignition switch is in the RUN position, the air bag diagnostic monitor runs periodic checks on the resistance of the driver and passenger air bag circuits. o Normal resistance from Pin 2 (Driver Air Bag Feed) to Pin 3 (Driver Air Bag Return) is between 1.4 ohms and 2.0 ohms. This resistance total results from the sum of the components in the circuit: the air bag module (approximately 1 ohm) and the air bag sliding contact (0.20 ohm to 0.35 ohm per winding, 2 windings total) plus a small amount of resistance due to the wire itself, crimps, etc. o If the resistance across these two pins exceeds 3.5 ohms, the air bag diagnostic monitor will interpret this as high resistance and the air bag diagnostic monitor will store in memory and flash out on the air bag indicator a DTC 32.
o If the high resistance is later serviced or otherwise falls into the normal range, the next ignition switch cycle will produce a DTC 72 (or a higher priority DTC if one exists). NOTE: The air bag connector, air bag diagnostic monitor harness connector, and the air bag sliding contact connector have metal spring clips that act as shorting bars. These shorting bars are built into the plastic hardshell connectors. The shorting bars are designed to short Circuits 614 (GY/O) and 615 (GY/W) together when the connectors are not mated. DO NOT attempt to remove the air bag shorting bar and measure the resistance of the air bag. The air bag sliding contact shorting bar may be removed to measure the air bag sliding contact resistance. Likewise, the shorting bar(s) in the air bag diagnostic monitor harness connector may be removed by removing the black spacer (locking wedge) from the connector. Use extreme caution when reinstalling the shorting bars to ensure they are installed correctly. o A poor connection or corrosion where the air bag sliding contact connects into the main wiring harness. The air bag sliding contact connector at the base of the steering column may have excessive resistance between the male and female terminals in the connector. Also, corrosion may occur on the terminal crimps on both the air bag sliding contact terminals and the main wiring harness terminals. o An open circuit or high resistance in the air bag sliding contact windings inside the air bag sliding contact. o An open circuit or high resistance in the wiring harness in either Circuit 614 (GY/O) or Circuit 615 (GY/W). o An open circuit or high resistance in the driver side air bag module. DO NOT attempt a direct resistance measurement of the air bag. Follow the diagnostic procedure to determine if the air bag module resistance is higher than normal. NOTE: If the air bag did not deploy in a collision, it may not have been needed. Complete all diagnosis before replacing the driver side air bag module (043B13). WARNING: THE ELECTRICAL CIRCUIT NECESSARY FOR SYSTEM DEPLOYMENT IS POWERED DIRECTLY FROM THE BATTERY (10653). TO AVOID ACCIDENTAL DEPLOYMENT AND POSSIBLE PERSONAL INJURY, THE NEGATIVE BATTERY CABLE MUST BE DISCONNECTED PRIOR TO SERVICING OR REPLACING ANY SYSTEM COMPONENTS. Disconnect battery ground cable (14301) and wait one minute for back-up power supply energy to be depleted. Remove two back cover plugs. Remove two screw and washer assemblies retaining driver side air bag module to steering wheel (3600). WARNING:	PLACE DRIVER SIDE AIR BAG MODULE ON BENCH WITH TRIM COVER FACING UP TO AVOID POSSIBLE PERSONAL INJURY. Disconnect the air bag sliding contact connector from driver air bag wiring. Remove driver side air bag module. Connect driver air bag wiring to air bag sliding contact connector. Position driver side air bag module to steering wheel and secure with two screw and washer assemblies. Tighten to 10.2-13.8 N-m (8-10 lb-ft). 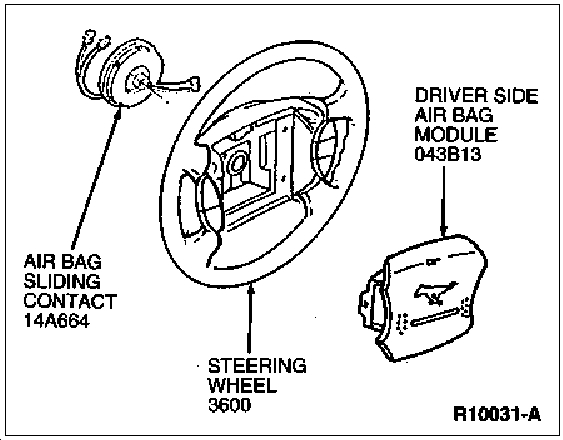 NOTE: The passenger side air bag module (044A74) is serviced as a complete assembly. Perform proper disposal procedure as outlined. o	Reaction housing with mounting hardware. o	An igniter inside the inflator converts electrical energy to thermal energy (heat), causing ignition of the gas generant. o	The ignition reaction causes combustion of the sodium azide/iron oxide gas generant producing nitrogen to fill the bag. o	Since the passenger side air bag module is much larger than the driver side air bag module (043B13), it contains more gas generant in a different inflator configuration to produce more nitrogen gas. o	It is a component of the passenger side air bag module and is not serviceable. o	Is constructed of ripstop nylon. o	Fills to a volume of approximately 0.227 cubic meters (8 cubic feet). o	Is not a serviceable item. o	Supplies support for the inflator. o	Provides a reaction surface for the passenger side air bag module. o	Is used to attach the trim cover. o	Contains mounting brackets that attach the passenger side air bag module to the instrument panel. o	Is textured and painted to match the surface of the instrument panel. o	Is constructed with a moulded-in tear seam that separates when the air bag inflates, and hinges out of the way during deployment. o	Its main function is to retain the air bag in the reaction housing during vehicle operation. Wait one minute for back-up power supply energy to be depleted. Open glove compartment (06010). Drop glove compartment to the floor by pushing sides of glove compartment towards each other. Remove two screws that attach RH A/C duct and remove duct. Remove two fore-aft air bag retaining bolts that attach passenger side air bag module (044A74) to instrument panel steel reinforcement. Disconnect air bag electrical connector on LH lower rear corner of passenger side air bag module. Remove air bag connector from steel reinforcement by prying "X-mas" tree out of hole in steel reinforcement. Pull each corner of air bag cover to disengage cover-to-instrument panel attachments. WARNING: PLACE AIR BAG MODULE ON BENCH WITH TRIM COVER FACING UP TO AVOID PERSONAL INJURY. 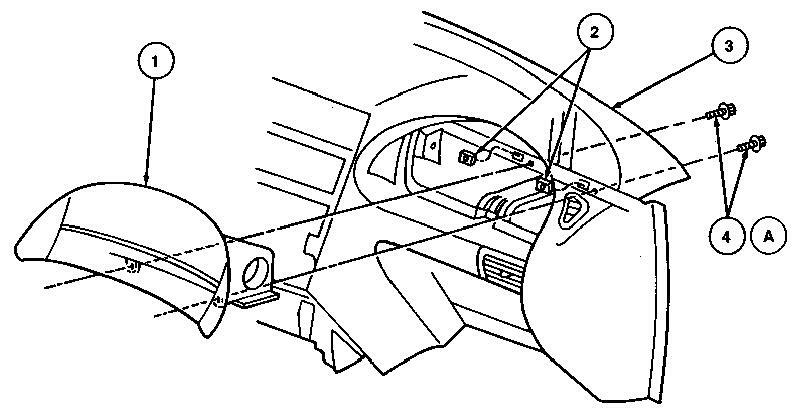 Gently push passenger side air bag module from behind, out of the instrument panel opening in order to pull passenger side air bag module out completely with both hands. Position passenger side air bag module in instrument panel opening and slide into position. Push "X-mas" tree into its hole in the instrument panel (04320) steel reinforcement. Connect the air bag connector. Attach two fore-aft air bag retaining bolts to the instrument panel steel reinforcement. Tighten to 7-11 N-m (62-97 lb-in). Push each air bag cover corner to engage cover-to-instrument panel attachment. Push sides of glove compartment toward each other to put glove compartment back into position. v (5)	Stored DTCs will be displayed. After service, repeat steps 1-4 and clean the DTCs cleared using the �DTC Clearing Procedure� .